Signing up to explore these initial MOOCs is easy enough: A click on any of the hyperlinks above will take you to the course Welcome page, where clicking the “Enroll for Free” button will begin an easy process of registering with email address and password. Moving from exploring to completing a MOOC, that’s not such a straightforward process according to drop out, stop out, completion data. About being part of a design team, whether or not in the instructor role: It is no easy task to create or run a MOOC. It is, thankfully, a rewarding team process from developing an initial idea and outcomes to setting out pedagogy, completing production, and engaging with participants. About being a participant: That pairing of not-so-easy with rewarding provides an apt naming for the duo of feelings most participants will experience within a MOOC, whatever the type of MOOC. It is rewarding to have access to a new world of ideas – whether as an active participant or a somewhat active lurker – via the course materials and resources, and to have access to participants dispersed across the world via the discussion forums. It is not so easy to wrangle this distributed collection of information and dispersed ideas into some semblance of sense making without first or simultaneously learning how to build a robust team at home to support the learning and thinking. Why is the University offering MOOCs? On this point, Provost Karen Hanson notes, “The University of Minnesota works constantly to improve teaching and learning, and has for a very long time looked to new technologies to play a role in improving learning outcomes and providing flexibility and better access to education. Remind me again, What’s eLearning? 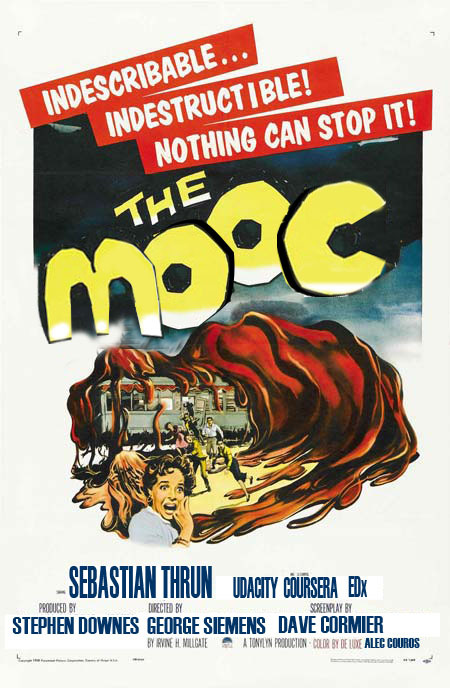 What’s a MOOC? Two things to set out here: First, an overview of how the UMinn Provost’s office locates MOOCs within the context of eLearning, the umbrella term for teachers and institutions making use of “new technologies” to support learning and teaching. Second, a quick sketching of two MOOC-types, one at either end of what needs to be(come) an emergent continuum with its full breadth and history honestly recorded and conveyed. As its name suggests, a massively open online course (MOOC) is a model for delivering learning content online to virtually any person—with no limit on attendance—who wants to take the course. A MOOC makes use of multiple technology tools to create a platform for the course to be offered. As participants in Coursera, you’ll navigate from and see just one platform – the one designed by the business entity hosting its array of MOOCs. As participants in the many MOOCs hosted outside of the business-based models, a participant might begin MOOCing via blog pages and move into a Moodle space for mucking about in resources, discussion and assignment sharing. In both models, individuals will build conversations in other Web 2.0 spaces – Twitter, Facebook, blogs like Tumblr and WordPress, image sharing spaces ranging from Slideshare to Flickr, and on to video postings via YouTube and Vimeo. A MOOC is different from an online course in other basic ways: Anyone can register for and participate in a MOOC. With registration, the participant will have free access to all instructional materials and resources, as well as access to interactions with all others participating in the MOOC. No fees. No academic credit. For MOOCs originating outside of Coursera and other proprietary platforms, an instructor often shares course materials beyond the MOOC itself. In these cases, course materials posted within a MOOC that becomes its own open educational resource (OER), or might be simultaneously curated and shared via social media as OERs that are licensed via Creative Commons with permissions for further sharing and mashing up with attribution. The same open idea can be applied to what participants create – will they continue to have access to content and discussions and assignment postings with feedback beyond the course (sometimes for a stipulated period of time)? Will they have options to post many if not all of their personal writing and course assignments in a public Web 2.0 place that can serve as a public portfolio of work and thinking? In terms of “access” – will these materials be accessible in term of disability access guidelines? Will I / How will I make it possible for students to have real audiences – within the course, alongside the course, and after the course? 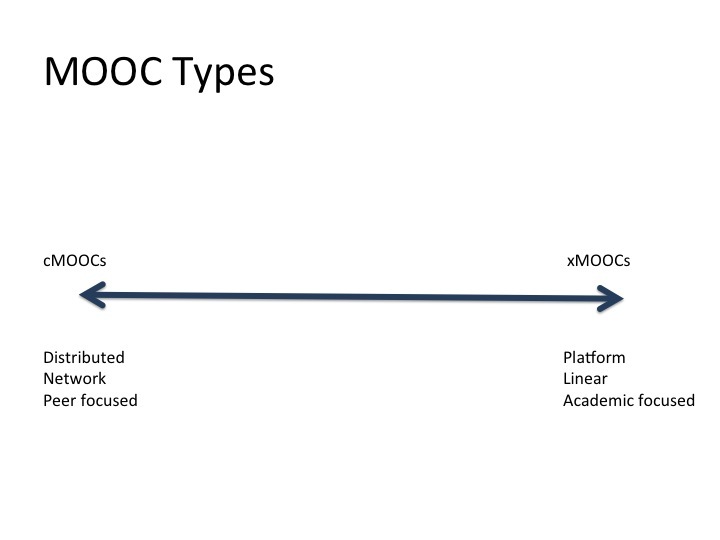 What’s the difference between a Coursera MOOC and a MOOC MOOC? The first self-described MOOC was “Connectivism and Connective Knowledge,” created by Stephen Downes and George Siemens at the University of Manitoba, Canada, in 2008. In 2012, elite American universities began to pick up on the idea of free, open online courses. Two Stanford professors, Sebastian Thrun and Peter Norvig, offered “Introduction to Artificial Intelligence” that year, and more than 160,000 students in 190 countries enrolled in the course. The duo started Udacity, a website and platform on which many MOOCs from several colleges and universities are now offered. Similar sites like EdX (initiated by MIT and Harvard) and Coursera (out of Stanford) also began in 2012, and offer MOOCs taught by distinguished faculty from a number of top-notch universities. The cMOOCs, then, make use of the “c” to signal connectivist roots and connectivism as pedagogical practice for an approach to learning and knowing; additionally, Stephen Downes names this informal/nonformal space an immersive learning environment. Carol Yeager describes the cMOOC space as “an aggregation of people who connect and build their learning among and between one another through various aspects of social media.” Hence, per Weller’s outline above, a distributed peer network of learners with a shared interest taking part in a MOOC facilitated by skilled orienteers relative to the topic. More likely than not, you’ve heard scads about xMOOCs and little about cMOOCs. Even more likely, what you’ve heard about xMOOCs has come via The Chronicle or Inside Higher Education or a local newspaper’s opinion page. All too often xMOOCs are cast together as part of a movement or moment that will fix or save or rescue or transform higher education. THE MOOC! the movie. Image by Giulia Forsythe. But as UMinnesota Provost Karen Hanson notes MOOCs are merely (okay, that’d be my word) a part of the eLearning picture. The Coursera-like platform is but one option, with a stretch of possibilities (yet) to be discovered and discussed. That discussion – on the UMinnesota campus as elsewhere – will need to address how any eLearning venture improves undergraduate teaching and learning; enhances learning, creativity, and retention across the broad range of students on campus; improves access to ideas, information and learning on and beyond campus; and is – or is not – a right fit for a particular teacher and her learners in a particular course, department, college. I find myself liking President Eric Kaler’s idea that we attend to eLearning “to galvanize our creativity” as teachers. Or, as Martin Weller shows the idea – to make use of MOOC-like practices within the eLearning stretch to experiment. To try an inverted or flipped classroom as part of our teaching. To engaged students in trying out new technologies – movies, podcasts, pecha kuchas, digital stories, slidecasts – to sort, synthesize and share the ideas that become insights worthy of open distribution. Why do a MOOC? Reason #2. Slide by Martin Weller. 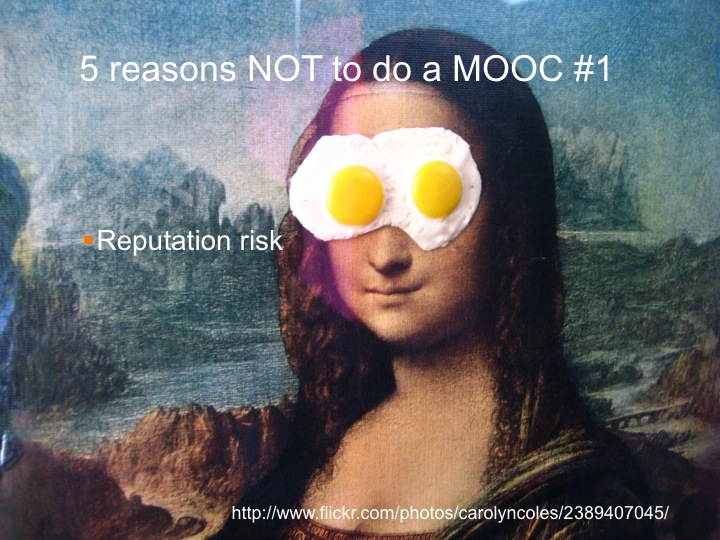 And, yes, there are lots of reasons to not try out a MOOC – whatever the alphabet soup that accompanies it. It is a reputation risk to just jump out there. To see how MOOCs can be a reputation enhancement, go back to the start of this post and have a go at one of the UMinnesota MOOC, then correspond with one of the members of the teaching and design team that brought that MOOC together in order to learn why there was a willingness to take the reputation risk – and to hear about the rewards of risk. Why NOT do a MOOC. Reason #1. Slide by Martin Weller. Explore the UMinn MOOCs so you can see and experience how these courses are set up and what participants are doing. What a MOOC is or might be is best comprehended by seeing, navigating, experiencing, doing a MOOC from somewhere on the active lurker to contributing particpant scale. Or, check out the List of Current and Future Connectivist MOOCs to find one or two that could be a muse to your creativity this summer. In each case, think small – maybe you’ll discover a new tool, or find a structure that would allow you to flip a class session or two, or be a participant in order to try your hand at creating something that makes use of Web 2.0 technologies or that becomes an open educational resource. And, do investigate local resources – this blog post (and some we’ve offerend on flipped / inverted classrooms), the U’s first eBook with its focus on technology and learning, or the nicely sequenced set of Digital Campus resources on eLearning for instructors wanting to fine out more and in the company of supportive electronic and human resources. All of these resources are open to people beyond the University of Minnesota. This is post #2 in a summer series on MOOCs, which opened last week with a discussion of liminal participants & skilled orienteers. During the next two weeks, we’ll take closers looks at the range of MOOC models emerging. From there, on to some of the educational theory behind MOOCs within the eLearning and learning in higher education contexts. 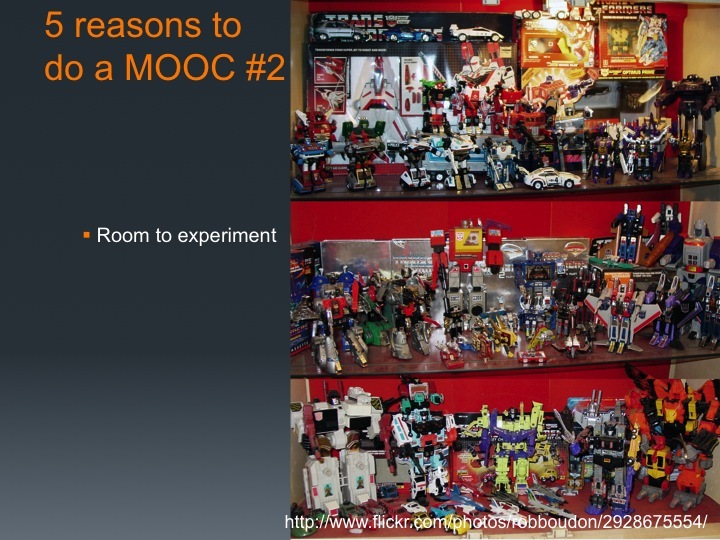 Both “Reasons” images are from Martin Weller’s slideset “5 Reasons to to a MOOC, 5 Reasons to NOT do a MOOC” – at http://www.slideshare.net/mweller/moocs-march-2013. MOOC the Movie image by Giulian Forsythe; available at http://www.flickr.com/photos/gforsythe/8028605773/. Creative Commons Licence: Attribution-NonCommercial-ShareAlike 2.0 Generic.